Not enough positive action to shift the overall outlook last week. As mentioned, major political events have been the only thing to really impact the market over the past year or so. We’ll have to see whether market reaction to the French election follows that trend. 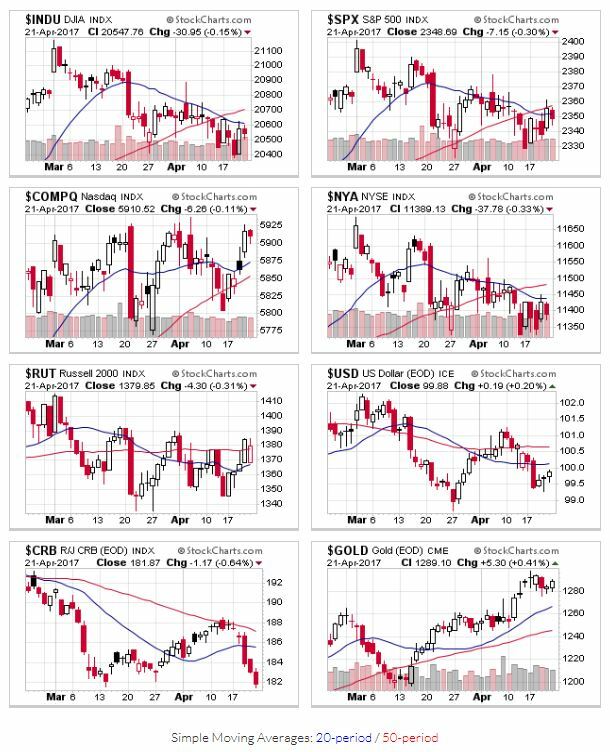 Most of the indexes ended a second week below their 20 and 50 day moving averages. In another show of strength, the Nasdaq rebounded and closed near record highs. all the other indexes rose slightly, but only the Russell 2000 was able to close above a support level (i.e. 20 day). Positive signs to be sure, but the outlook remains in a downtrend until we can retake the 50 day. The only change to price/volume action was in the Dow, which added one day to its tally. Overall, the S&P500 and DJIA have 8, the NYSE has 7, and the NASD has 4. Not much activity from leading stocks either. Bases continue to be built, which is a positive sign. OEW remains in a downtrend, and key support levels are still a few percent away. This entry was posted in Historical Data, Market Trends, Other Blogs. Bookmark the permalink.